The Allie 25 inch vanity combo brings to you good looks and generous storage. An uncomplicated design scheme gains luster from the sophisticated Twilight Gray finish with brushed silver trim and hardware. A solid birch wood frame, plywood drawer boxes, dovetail joints, a convenient toe kick, and soft-close glides and hinges testify to the quality of construction. The vanity combo includes a white quartz top and retangular undermount sink. A large open shelf provides ample storage. Style. Function. Versatility. The 37-inch Brooks vanity combo will be the cornerstone of your bathroom, providing ample storage space in a compact design. Featuring a chilled gray finish and clean lines, the Brooks embraces a transitional aesthetic that is timeless and pure. The combo includes a durable carrera white marble top and oval white vitreous china sink. Inspired by mid-century modern console design, the Coventry Collection from Avanity features solid teak construction with minimal ornamentation. The 49 inch gray teak Coventry features soft-close doors, sturdy and stylish splayed legs, and an abundance of storage space. Teak is the perfect material for bathroom furniture, as it is both durable and water resistant. With Coventry form follows function with superb simplicity. The combo includes a natural Carrera white marble top and undermount rectangular sink. Add understated elegance to your bathroom with the Delano Collection. Spare in style, we designed Delano to accent a range of bathroom dicor, blending simple beauty with unmatched versatility. Whether you choose the Taupe Glaze or White Finish, the 24-inch Delano features a durable solid wood frame and sophisticated black bronze pulls, 1 flipped down DWR and 2 functional DWRs. The combo includes a durable carrera white marble top and rectangular white vitreous china sink. Allie 25 inch Vanity Combo in Twilight Gray w/ Silver Trim with White Quartz Top The Allie 25 inch vanity combo brings to you good looks and generous storage. An uncomplicated design scheme gains luster from the sophisticated Twilight Gray finish with brushed silver trim and hardware. A solid birch wood frame, plywood drawer boxes, dovetail joints, a convenient toe kick, and soft-close glides and hinges testify to the quality of construction. 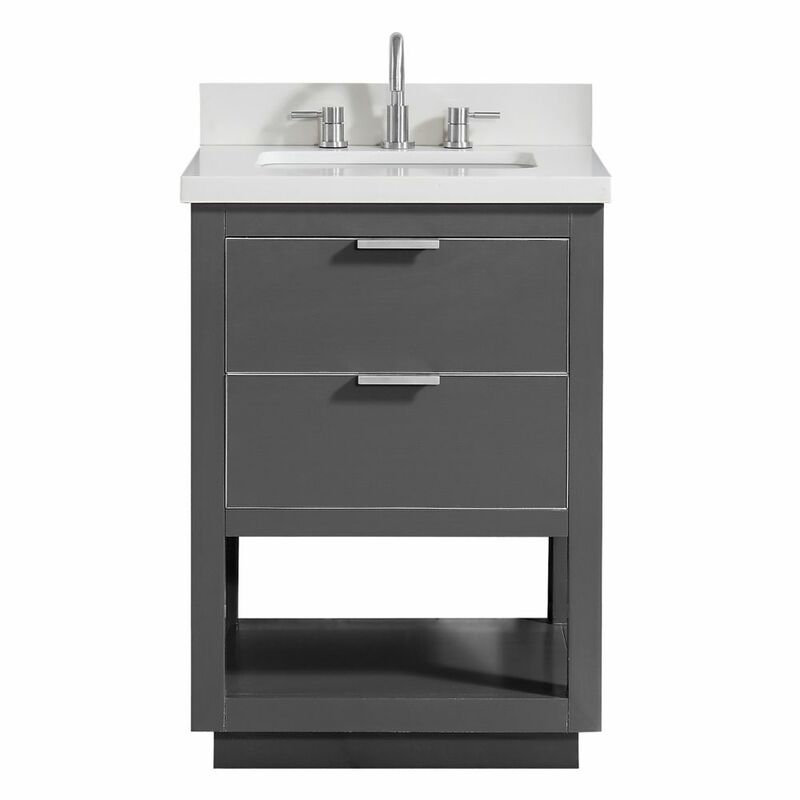 The vanity combo includes a white quartz top and retangular undermount sink. A large open shelf provides ample storage.